Egypt’s parliament – the House of Representatives – approved on Sunday a three-month extension of a nationwide state of emergency. Parliament speaker Ali Abdel-Aal told MPs that President Abdel-Fattah Al-Sisi issued a presidential decree (no.17/2019) extending the state of emergency for three months, starting 1am on 15 January 2019. "The decree, which goes in line with Article 154 of the constitution, requires the approval of a two-thirds majority of MPs," said Abdel-Aal. The decree was approved without discussion as it represents the second extension of the decree which was passed on 21 October 2018 (no 473/2018) imposing the state of emergency for three months and until the end of 14 January 2019. 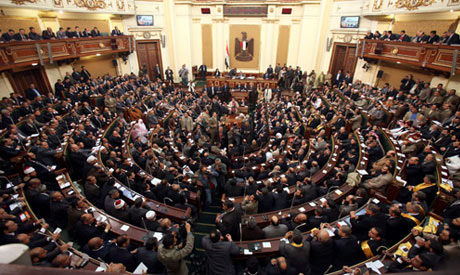 MPs stood up in approval when Abdel-Aal put the decree up for a vote. Abdel-Aal indicated that parliament's internal bylaws (article 131) also state that "the prime minister should inform the parliament speaker seven days ahead of the declaration of the state of emergency so that parliament can decide on the reasons and justification which led the president and the government to declare the state of emergency." El-Sisi's decree states in Article 2 that the military and police authority will take all the measures necessary to stand up to the threat of terrorism and its sources of funding, preserve security across the country, safeguard public and private property, and protect the lives of citizens. Article 3 states that all the powers granted by the emergency law (no.162/1958) to the president of the republic will be also used by the prime minister to protect the national and internal security of the country. A report prepared by parliament's defence and national security committee said that the extension is necessary due to security challenges still facing Egypt. "Largely thanks to the emergency law, the military and police forces were able to eliminate most of the terrorist movements threatening the country, particularly in North Sinai" said the report. "However, the emergency law will remain a tool important and necessary to help safeguard the country against terrorist threats coming from neighbouring countries like Libya and Gaza, and give police forces the powers necessary to foil any terrorist attempts targeting the national and internal security of Egypt," the report said. The report, reviewed by the head of parliament's Defence and National Security Committee and former chief of military intelligence Kamal Amer, said "the emergency law has been highly effective in uncovering a number of terrorist organisations and foiling their operations," said Amer, adding that "emergency measures in the coming period will be mainly focused on battling other terrorist movements, revealing their sources of funding and whether they have contacts with foreign elements." "The declaration of emergency goes in favour of securing the higher interests of Egypt and represents a very effective tool in eliminating the threat of terrorism," said Amer. President El-Sisi first imposed the three-month nationwide state of emergency in April last year, following twin bombings at two churches in Gharbeya and Alexandria, which killed at least 47 and wounded over 120. The last time the state of emergency was imposed was on 21 October 2018, extending it to 14 January 2019. At that time, Prime Minister Mostafa Madbouly told MPs that the extension is still necessary due to security challenges facing the country and the importance of fighting terrorist movements targeting Egypt. "The extension of the state of emergency is also necessary to ensure that the country moves forward on the road of comprehensive development in a climate of complete stability," said Madbouly, adding that "the efforts of combating terrorism have helped a lot in recovering stability and achieving a lot in the area of development." Madbouly said that terrorist acts that have led to the killing of security forces and civilians are just desperate attempts orchestrated by rogue criminal elements. "Security and army forces were able to eliminate most of these elements and uncover their conspiracies as part of the framework of Operation Sinai 2018," said Madbouly, arguing that "these successes make it necessary to help forces complete the war against dark forces." Madbouly vowed that the government will resort to taking exceptional measures only in a way that strikes a balance between public freedoms and the necessities of national security. "The state of emergency is mainly aimed at helping security and army forces to uproot terrorism," said Madbouly.